Written By: Arthur Agatston, M.D. very old. In today's fast-food-obsessed, couch-potato culture, two-thirds of all adults and one-third of all children are either overweight or obese, rates of diabetes and heart disease are soaring, and the future for many of us looks dismal. 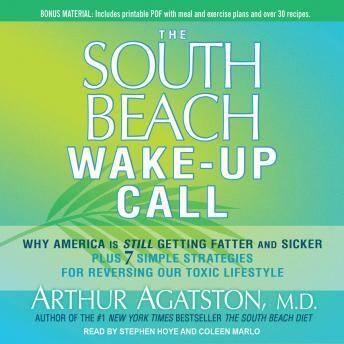 and creator of the South Beach Diet Dr. Arthur Agatston, who is determined to reverse America's failing health profile. After explaining how we got to this sorry state, Dr. Agatston introduces his Toxic Turnaround. This empowering program provides realistic strategies and tools everyone can use to shop, cook, eat, and exercise better-improving the family table, getting quality sleep, reducing stress, and making our homes and communities healthier. Informed by cutting-edge research and the tenets of a diet that has already changed the way America eats, this book goes to the next level, providing a blueprint for all Americans to make positive and sustainable lifestyle changes that will not only improve their own health but that of generations to follow.